International Business Made EZ (IBEZ) Syllabus. IBEZ is a 1.5 day course on how to start a micro business for extra income. The course is based on Merri’s and my experience of what we have done and are doing now with our own business run from our home with over 20,000 clients in dozens of countries. See the International Business Made EZ Syllabus below. Join us for our international business seminars “International Business Made EZ 2011″. When you enroll in an IBEZ seminar we email a download of the previous seminar so you immediately gain the basics that apply to each seminar and will be able to pick up on the new economic conditions and where to invest. The syllabus below was for our Jefferson, North Carolina, October 8 to 9, 2011 seminar. Session #1: Why having an international micro business is easier than ever before. Session #2: What’s Next? Trading down. How the next imagination era affects business opportunity now. How business will shift to the lower end and how small businesses can benefit from niche markets. Session #3: Other forces affecting business economics. How to get started. How to find your idea for a PIEC (Personal Income Earning Corridor). How to and & why you should start small. Session #4: Seven ways to have a business with your idea. Buy it – build it – sell it – picture it – wrote about it – teach it – manage it. Session #5: The business evolutionary process. How to grow your business in a risk free, low stress way. Session #7: “Seven Ps” (Problem, Person, Place, Prospecting, Product, Promise, Presentation Product) How to zero in on key word phrases. Session #8: How to figure out the problem your business will solve. Session #9: How to figure out who are the people who have the problem. Session #10: How to create the profitable product. Session #11: How to figure our the place where your businesses people are. Session #12: How to prospect for your clients. Session #13: How to create a promise to attract your client. Session #14: How to develop a presentation that moves your client to action. Session #15: How to use the internet. How to set up. How to use it to prospect and to sell products. How to use the internet to create products. How to get good Google rankings. We share in this session how we have learned to use Pay Per Click and Search Engine Optimization. Take a look at one week of our recent message headlines. 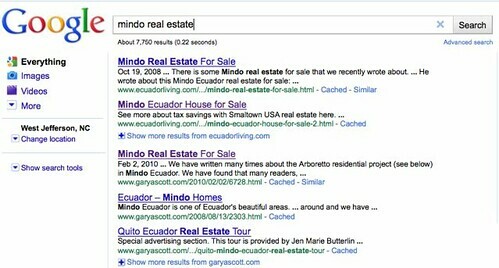 #2 and “Mindo Real Estate” ranked… #1, #2, #3, #4 and #5! Plus this session look at how to build your client list. 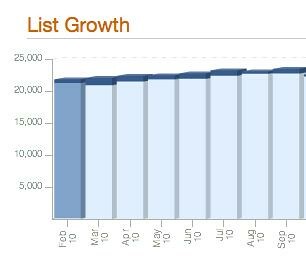 This chart from our auto responding company Mail Chimp shows how our list grows about 800 new addresses a month. Session #16: How to turn words into cash. Session #17: How & why markets are shifting from materialistic needs to emotional needs. Session #18: Cashing in on markets in love-friendship-control-freedom-tradition-change-big answers-recognition and care. Session #19: How to use the power of authenticity. Session #20: How to develop the correct legal structures for asset protection and tax efficiency. Session #21: There is a shift of emphasis from GDP to GWB (General Wellness Barometer Happiness Factor). Business will operate with more passion. I call these seven areas the Magnificent Seven… these are the places where I am looking for opportunity and focusing our business efforts now. Our sales doubled during the recession. Our list of readers increased over 100%. Since the economy picked up our business growth has slowed but business is still growing. 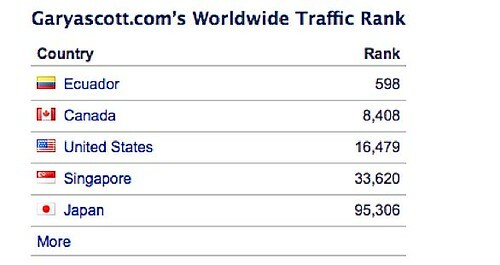 This is how good, value oriented business grow by the way…. jumping up in bad times and remaining steady when things are good. The seminar explains why this business model that seems upside down works best. Join us for our international investing seminars “International Business Made EZ 2011″. Previous course delegates have included business people, brokers and professionals, doctors, dentists, lawyers, retirees, couples wanting to get into international business together, insurance agents and marketers who want to enhance their wealth and security through international investments. Attend both International Investing Made EZ & International Business Made EZ seminars (Save $249 or $499 for two) on Friday Saturday and Sunday. See International Investing Made EZ Friday and Saturday morning. See more details about our International business seminars here.